Vincenzo Nibali and Roman Kreuziger will go head-to-head for the first time in a Grand Tour this May at the Giro d’Italia. After five years, Kreuziger split with team Liquigas this winter to lead team Astana. 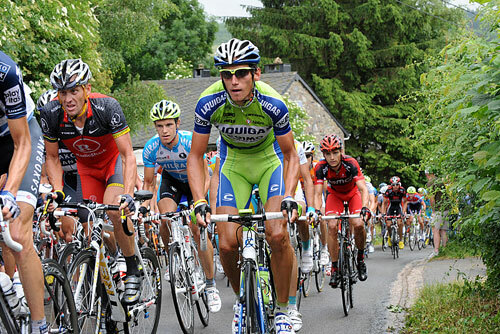 The 24-year-old Czech began his professional career with Italy’s top team, Liquigas in 2006. Team management took note of him in 2004 after he won the junior World Championships and offered him a contract midway through 2005. He won the Tour of Switzerland in 2008 and Tour of Romandy in 2009, and in the last two editions of the Tour de France, finished ninth overall. However, with both Giro d’Italia winner Ivan Basso and Vuelta a España winner Vincenzo Nibali in Liquigas’ ranks, Kreuziger thought it was best to change teams. In August, he announced that he annulled his contract a year early so that he could join Astana. Nibali went on to win the Vuelta a España and now, wants to focus on winning his home Grand Tour, the Giro d’Italia. Last year, he finished third overall while helping Basso win. This year, the 26-year-old will lead team Liquigas and face off with Kreuziger, 18 months younger. Kreuziger will race the GP Friuli, Paris-Nice, Giro del Trentino and the Tour of Romandy, and skip the Ardennes Classics prior to the Giro d’Italia. He’ll lead team Astana at the Giro d’Italia, May 7 to 29, and Alexander Vinokourov will lead at the Tour de France.